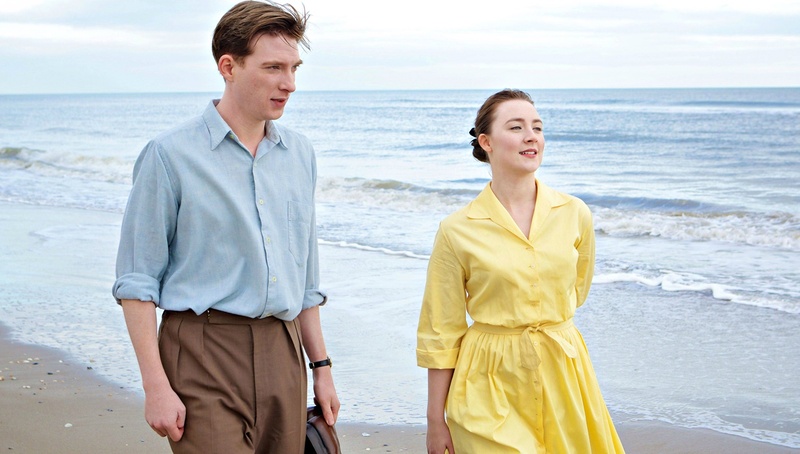 John Crowley and Nick Hornby’s adaptation of Colm Tóibín novel Brooklyn is a thing of beauty. Epic in terms of romance, polished with extraordinary lighting and framing, it whisks the viewer away to a period that was both terrifying and exciting. Fox Searchlight is certainly hoping to repeat their success last year by having the biggest and best looking independent film in the awards race. Gorgeous from opening shot to final scene, Brooklyn’s secret weapon is the transcendent performance by Oscar nominee Saoirse Ronan (Atonement, Hanna). One of the season’s true epic romances (and not just between people), Brooklyn has all the right stuff to be recognized in multiple awards season categories. Eilis left her small Irish town for the big world of America in 1952. No promise of a prosperous life back home, it was her older sister Rose (Fiona Glascott) who helped secure a boarding house and employment in Brooklyn among the flourishing Irish immigrants. Eilis could have coined the phrase “fresh off the boat” with her naiveté about the rest of the world. However a quick study, strong willed and thoughtful and after a few months she meets a young Italian plumber named Tony. Her letters back home to Rose and mother change from longing to promising and cheerful. Bad news from Ireland beckons her return and when she makes the long journey home to visit she finds things changed and her heart torn between two countries. Ronan delivers a benchmark performance that will stand very tall among the best of the year. The crew on Brooklyn really excel at transporting the viewer into the time period, not just with the award worthy costumes or glossy set decoration, it’s more than that. Everything happens for the first time with Eilis, without being sentimental or elementary. Often times the camera takes long pauses just to explore the porcelain like face of Ronan who projects feelings without words and can cry streaming tears on command. It would be difficult to find a performance in Ronan’s extensive career where her talents are not on fully display, but this is a benchmark performance that will stand very tall among the best of the year. Irish American herself, Ronan dissolves into the role so well, as if it were written for her. Julie Walters (Harry Potter, Paddington) is a scene stealer among the supporting performances and much of the films comedic effect. Newcomer Emory Cohen (The Gambler, A Place Beyond the Pines) is also startlingly refreshing. What begins much like Marion Cotillard’s journey to America in The Immigrant turns out to be something very different in style, presentation and genre. In a scene where Eilis and boyfriend Tony (Cohen) visit Coney Island for the first time, the entire frame looks like a yesteryear postcard with stunning pastel colors. Filled with genuine moments of laughter, heartbreak and swoon, Brooklyn is one of the best films of 2015 because of the conversation it has about the definition of home and the artistry is displays. An emotionally cultivating piece of cinema that includes one of the year’s most breathtaking performances.